Introducing the Miss Audrey Dress pattern by 1 Puddle Lane - and what a beautiful pattern it is! Elegant princess seams and the choice of either a pleated or gathered skirt, invisible zip at the back and you choose whether to line or not, this dress has some great options - including in-seam pockets and cup sizing from A-DD - hooray!! So much easier to get a really great fit! 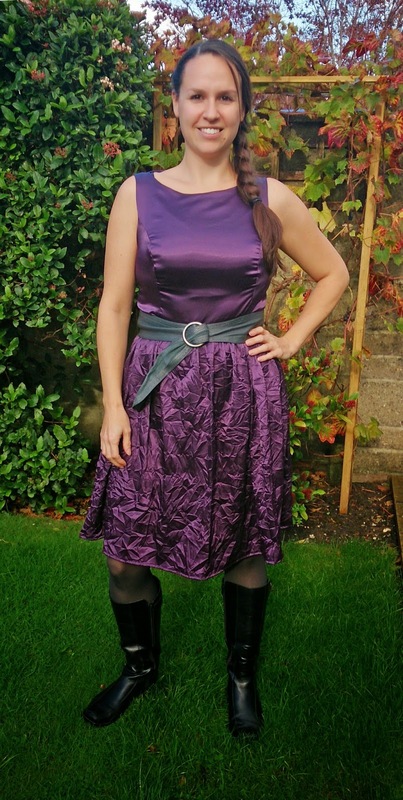 There are so many different fabrics you could use for this dress to either make it super dressy or more of a daytime dress - I went with this crinkle silky satin I have had in my fabric stash for a loooong time! It wasn't the easiest to work with, but I just love the colour and soft floatiness of it! Testing this dress was great fun, I loved seeing all the different ways the other lovely ladies in the group styled the dress and Ann the designer was SO helpful! She went totally above and beyond to make sure everyone managed to get a perfectly fitting dress - and she plans to offer this same help to all who would like to join in with the SEW-A-LONG she has planned - you'll get step-by-step instructions for making the dress and fixing any fitting problems you may have, and best of all there will be a Facebook group where everyone can support each other and share pictures of their pretty dresses! If you're interested in joining in all the information is here, and it starts on 1st December. And if you haven't already, have a look at Ann's blog page for more information and pictures of the dress. That is stunning, love the colour and the material. It hangs beautifully all round on the skirt, just love the gathering. The bodice is so neat and flattering, and I love the dainty shoulders. Very nice.